The programs we’ve seen in previous chapters do pretty much the same thing every time, regardless of the input. For more complex computations, programs usually react to the inputs, check for certain conditions, and generate appropriate results. This chapter presents the features you need for programs to make decisions: a new data type called boolean, operators for expressing logic, and if statements. The result of a relational operator is one of two special values, true or false. These values belong to the data type boolean; in fact, they are the only boolean values. You are probably familiar with these operations, but notice that the Java operators are different from the mathematical symbols like =, ≠, and ≤. A common error is to use a single = instead of a double ==. Remember that = is the assignment operator, and == is a comparison operator. Also, there is no such thing as the =< or => operators. The two sides of a relational operator have to be compatible. For example, the expression 5 < "6" is invalid because 5 is an int and "6" is a String. When comparing values of different numeric types, Java applies the same conversion rules we saw previously with the assignment operator. For example, when evaluating the expression 5 < 6.0, Java automatically converts the 5 to 5.0. The result of fruit1.equals(fruit2) is the boolean value false. Java has three logical operators: &&, ||, and !, which respectively stand for and, or, and not. The results of these operators are similar to their meanings in English. For example, x > 0 && x < 10 is true when x is both greater than zero and less than 10. The expression evenFlag || n \% 3 == 0 is true if either condition is true, that is, if evenFlag is true or the number n is divisible by 3. Finally, the ! operator inverts a boolean expression. So !evenFlag is true if evenFlag is not true. Logical operators evaluate the second expression only when necessary. For example, true || anything is always true, so Java does not need to evaluate the expression anything. Likewise, false && anything is always false. Ignoring the second operand, when possible, is called short circuit evaluation, by analogy with an electrical circuit. Short circuit evaluation can save time, especially if anything takes a long time to evaluate. It can also avoid unnecessary errors, if anything might fail. Negating a logical expression is the same as negating each term and changing the operator. The ! operator takes precedence over && and ||, so you don’t have to put parentheses around the individual terms !A and !B. De Morgan’s laws also apply to the relational operators. In this case, negating each term means using the “opposite” relational operator. The expression in parentheses is called the condition. If it is true, the statements in braces get executed. If the condition is false, execution skips over that block of code. The condition in parentheses can be any boolean expression. If the remainder when x is divided by 2 is zero, we know that x is even, and this fragment displays a message to that effect. If the condition is false, the second print statement is executed instead. Since the condition must be true or false, exactly one of the branches will run. However, it’s better to use braces – even when they are optional – to avoid making the mistake of adding statements to an if or else block and forgetting to add the braces. As a result, the second println runs no matter what. Even experienced programmers make this mistake; search the web for Apple’s “goto fail” bug. These chains can be as long as you want, although they can be difficult to read if they get out of hand. One way to make them easier to read is to use standard indentation, as demonstrated in these examples. If you keep all the statements and braces lined up, you are less likely to make syntax errors. The outer conditional has two branches. The first branch contains a print statement, and the second branch contains another conditional statement, which has two branches of its own. These two branches are also print statements, but they could have been conditional statements as well. These kinds of nested structures are common, but they get difficult to read very quickly. Good indentation is essential to make the structure (or intended structure) apparent to the reader. The parentheses are unnecessary, but they make the code easier to read. A variable defined in this way is called a flag, because it signals or “flags” the presence or absence of a condition. This example defines a method named printLogarithm that takes a double value (named x) as a parameter. It checks whether x is less than or equal to zero, in which case it displays an error message and then uses return to exit the method. The flow of execution immediately returns to where the method was invoked, and the remaining lines of the method are not executed. This example uses System.err, which is an OutputStream normally used for error messages and warnings. Some development environments display output to System.err with a different color or in a separate window. This example uses nextDouble, so the Scanner (provided by the main method) tries to read a double. If the user enters a floating-point number, the Scanner converts it to a double. But if the user types anything else, the Scanner throws an InputMismatchException. The Scanner class provides hasNextDouble, which checks whether the next token in the input stream can be interpreted as a double. If so, we can call nextDouble with no chance of throwing an exception. If not, we display an error message and return. The name of the method is countdown; it takes a single integer as a parameter. If the parameter is zero, it displays the word “Blastoff”. Otherwise, it displays the number and then invokes itself, passing n - 1 as the argument. A method that invokes itself is called recursive. What happens if we invoke countdown(3) from main? The execution of countdown begins with n == 0, and since n is zero, it displays the word “Blastoff!” and then returns. The countdown that got n == 1 returns. The countdown that got n == 2 returns. The countdown that got n == 3 returns. As a second example, we’ll rewrite the methods newLine and threeLine from Section 4.3. This method takes an integer, n, as a parameter and displays n newlines. The structure is similar to countdown. As long as n is greater than zero, it displays a newline and then invokes itself to display (n−1) additional newlines. The total number of newlines is 1 + (n − 1), which is just what we wanted: n.
In the previous chapter, we used a stack diagram to represent the state of a program during a method invocation. The same kind of diagram can make it easier to interpret a recursive method. Remember that every time a method gets called, Java creates a new frame that contains the current method’s parameters and variables. 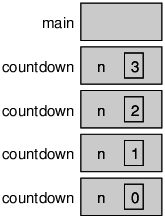 Figure 5.1 is a stack diagram for countdown, called with n == 3. Figure 5.1: Stack diagram for the countdown program. There are four frames for countdown, each with a different value for the parameter n. The last frame, with n == 0, is called the base case. It does not make a recursive call, so there are no more frames below it. If there is no base case in a recursive method, or if the base case is never reached, the stack would grow forever, at least in theory. In practice, the size of the stack is limited; if you exceed the limit, you get a StackOverflowError. This method displays the string until the stack overflows, at which point it throws an exception. The countdown example has three parts: (1) it checks the base case, (2) displays something, and (3) makes a recursive call. What do you think happens if you reverse steps 2 and 3, making the recursive call before displaying? Reading these remainders from bottom to top, 23 in binary is 10111. For more background about binary numbers, see http://www.mathsisfun.com/binary-number-system.html. If value is zero, displayBinary does nothing (that’s the base case). If the argument is positive, the method divides it by two and calls displayBinary recursively. When the recursive call returns, the method displays one digit of the result and returns (again). The leftmost digit is at the bottom of the stack, so it gets displayed first. The rightmost digit, at the top of the stack, gets displayed last. After invoking displayBinary, we use println to complete the output. Learning to think recursively is an important aspect of learning to think like a computer scientist. Many algorithms can be written concisely with recursive methods that perform computations on the way down, on the way up, or both. A data type with only two values, true and false. An operator that compares two values and produces a boolean indicating the relationship between them. An operator that combines boolean values and produces a boolean value. A way of evaluating logical operators that only evaluates the second operand if necessary. Mathematical rules that show how to negate a logical expression. A statement that uses a condition to determine which statements to execute. One of the alternative sets of statements inside a conditional statement. A way of joining several conditional statements in sequence. Putting a conditional statement inside one or both branches of another conditional statement. A variable (usually boolean) that represents a condition or status. The process of invoking (and restarting) the same method that is currently executing. A method that invokes itself, usually with different arguments. A condition that causes a recursive method not to make another recursive call. A system that uses only zeros and ones to represent numbers. Also known as “base 2”. The code for this chapter is in the ch05 directory of ThinkJavaCode. See page ?? for instructions on how to download the repository. Before you start the exercises, we recommend that you compile and run the examples. If you have not already read Appendix A.6, now might be a good time. It describes the DrJava debugger, which is a useful tool for tracing the flow of execution. Logical operators can simplify nested conditional statements. For example, can you rewrite this code using a single if statement? Draw a stack diagram that shows the state of the program the second time zoop is invoked. What is the complete output? Draw a stack diagram that shows the state of the program in Section 5.8 after main invokes nLines with the parameter n == 4, just before the last invocation of nLines returns. Fermat’s Last Theorem says that there are no integers a, b, and c such that an + bn = cn, except when n ≤ 2. Hint: You may want to use Math.pow. ’cause there are no more bottles of beer on the wall! And then the song (finally) ends. Write a program that displays the entire lyrics of “99 Bottles of Beer”. Your program should include a recursive method that does the hard part, but you might want to write additional methods to separate other parts of the program. As you develop your code, test it with a small number of verses, like 3. This exercise reviews the flow of execution through a program with multiple methods. Read the following code and answer the questions. Write the number 1 next to the first line of code in this program that will execute. Write the number 2 next to the second line of code, and so on until the end of the program. If a line is executed more than once, it might end up with more than one number next to it. What is the value of the parameter blimp when baffle gets invoked? Now that we have conditional statements, we can get back to the “Guess My Number” game from Exercise 4. You should already have a program that chooses a random number, prompts the user to guess it, and displays the difference between the guess and the chosen number. Adding a small amount of code at a time, and testing as you go, modify the program so it tells the user whether the guess is too high or too low, and then prompts the user for another guess. The program should continue until the user gets it right. Hint: Use two methods, and make one of them recursive.